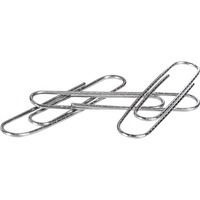 Clips are great for fastening small documents, attaching memos or samples to existing paperwork. Heavy gauge elliptical wire grips papers tightly. Zinc galvanized plating protects clips against corrosion. Nonskid ridged finish prevents clips from accidentally slipping off papers.